Survival is a multi-player minigame in WarioWare: Smooth Moves. Each player plays as a Mii. 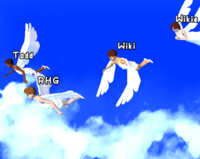 The players are shown as angels flying through the sky. One player is selected randomly to play a microgame; if they win, the player goes into the next round. However, if the player loses the game, they fall from the sky and are eliminated from the game. The winner is the last player standing. After each round is played the background changes, from daytime, to evening, to nighttime, before going back to daytime. This page was last edited on April 5, 2018, at 12:54.